Turning Men Into Demi-Gods! Increases Stamina & Energy! Turning Men Into Demi-Gods! Increases Stamina & Energy!Turning Men Into Demi-Gods! Increases Stamina & Energy! It’s no secret, Prohormone cycles are extremely popular with those looking to increase muscle mass and strength, but as we all know, they come with certain drawbacks. Perhaps youve used such products before, only to experience these drawbacks firsthand. Ask yourself, have you ever felt lethargic while on cycle? Have you ever felt that lethargy limited your ability to get the most out of your cycle? Perhaps you felt you could have pushed harder, seen better results, if only you had the energy? Or maybe youve never done a cycle, and the concerns regarding lethargy and low libido are holding you back, causing you to seek a solution to such issues before taking the next step. Well look no further, SUP3R-DHEA was designed specifically to UNLEASH your inner Demi-God, crush on cycle lethargy and take your workouts to the next level! It is a premium quality transdermal product which can aid those seeking to reduce body fat, increase lean muscle mass and enhance performance! But most importantly, it helps keep the body hormonally balanced during a suppressive cycle. 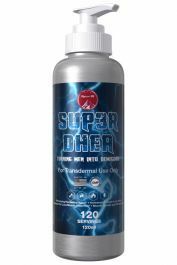 So how does SUP3R-DHEA do this? Well, while many people are under the impression that they fully understand the suppression of the HPTA that occurs while on cycle, one important aspect is often overlooked. When the HPTA is suppressed, its not only Testosterone, DHT and Estrogen that decline in production, but DHEA and Pregnenolone as well. These two hormones are just as vital to various physiological processes as Testosterone, DHT and Estrogen are! In fact, Endocrinologists frequently put men who are prescribed Testosterone-Replacement Therapy (TRT) on supplemental DHEA and Pregnenolone for this very reason! Thus, SUP3R-DHEA was formulated with this in mind. So as you can see, SUP3R-DHEA is a well-rounded, premium-quality transdermal product that has numerous benefits to anyone on cycle! Its effects go above and beyond just that of a simple Test Base mitigating the effects of lethargy brought on by prohormone and designer hormone use! So what is SUP3R-DHEA?So what is SUP3R-DHEA?